A reasonable jury could certainly find the continued presence, and sanctioned routine use, of an open urinal in the North Park garage -- to which Plaintiff, when hired as the sole-female laborer, reported to receive daily work assignments and was otherwise present for job-related materials and duties during the work day -- to meet the elements comprising [a] violation of Title VII. 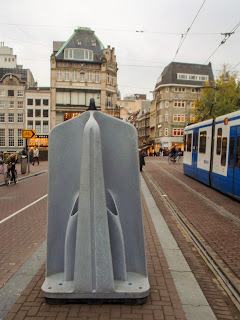 I wanted to highlight this case because if you've ever been to Amsterdam, then you may have noticed that in certain parts of the city, particularly those with lots of bars, there are open urinals in which men relieve themselves in public view. The one pictured above is not in use, but if you search the internet, you can find plenty of photos with long rows of urinals and at least two men at each of them. Recently, Amsterdam has begun to install urinals with locking doors for women. While I thought the street urinals were odd, I was really taken aback when I visited the science museum NEMO. 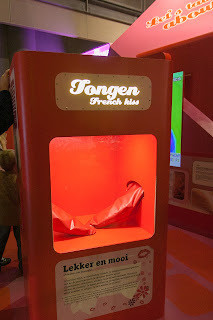 The exhibit "Teen Facts" includes a large rectangular box that is used to demonstrate French kissing. One person stands on each side of the box, and they insert their arms to manipulate two gigantic tongues. The exhibit also features mannequins posed in dozens of sexual positions, including one called "the cat." Since this blog is rated PG-13, I haven't included a photo of the cat. Science, anyone? So are open urinals a well-justified convenience or an indefensible assault on our workplace sensibilities? I suppose there is no definitive answer. The pragmatic Dutch may view open urinals as a no-brainer. The urinal in the Bogaski case was no less discrete than one of Amsterdam's street urinals. It was the Duchamp "fountain"-type of urinal and was situated against the wall between two privacy walls made of cinder blocks. 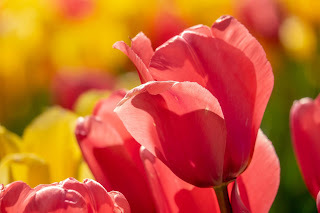 But the wacky Dutch, with their windmills, wooden shoes, and French kissing exhibits may not be the best measure for the American workplace. By comparison, we Americans are prudes when it comes to bodily functions and sexual conduct. Bogaski's claim has to be evaluated from the perspective of a reasonable woman in similar circumstances, which includes the social mores of American society and the American workplace.